From being a promising remedy for skin ailments for the American and Mexican tribal population to a vital element in popular skin care liniments and cough formulas, Balsam Tolu extracts and its essential oil have traveled a long way in the history of natural medicine. With a unique and fresh vanilla-like aroma, Balsam Tolu is used as a natural fragrance in perfumes, creams, soaps, shampoos, hair tonics and diaper rashes creams. 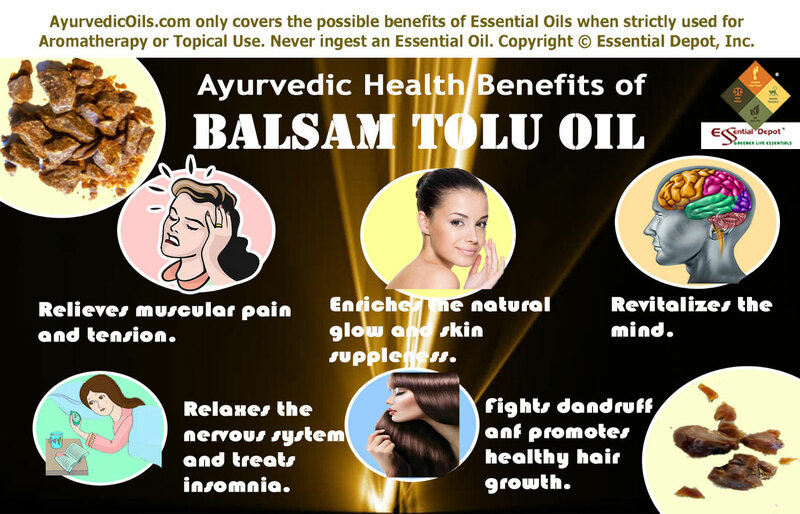 History is always fascinating and Ayurvedic use of Balsam Tolu indeed owns an interesting history behind its scene. It was the Native Indians who identified the medicinal values of Balsam Tolu during their reign of Peru while they were residing in the South and Central American provinces, where Peru was recognized as the birthplace of the Balsam trees in the ancient period. Being the traditional Indian medicine, Ayurvedic remedies prescribe Balsam Tolu and its essential oil for asthma, migraine, tuberculosis, abscesses, bronchitis, cough, ringworm, wounds, bed sores, scabies, sprains and certain venereal diseases. Historical uses and significance of Balsam Tolu essential oil and its other extracts: Botanically known as Balsamum tolutanum, Balsam Tolu is the resin extracted from the Myroxylon tree. It is grown primarily in South America and Central America. This tree has a natural resin producing ability and this resinous Balsam is called by other alternate names including Balsam Peru, Peruvian Balsam, Toluifera pereirae, Myroxylon Balsamum, Indian Balsam, Quina and China oil. The gummy resin tapped from this tall tree is then made into Balsam and the major exporters of Balsam of Tolu are Columbia, El Salvador and Venezuela. The tribal people from Central America and Mexico used the leaves and bark of the Balsam Tolu tree as a folklore remedy for arthritis, wounds, cold, flu and asthma. The name ‘Tolu’ denotes the tribal race ‘Tolues’ from Columbia and it is said that they used this tree as an ancient remedy for various conditions. The tribal populace who were aboriginal to the rainforest area used various parts of this tree in the treatment of tuberculosis, wounds, headache, rheumatism, asthma, venereal diseases, abscesses, sprains, catarrh, sores and bronchitis. 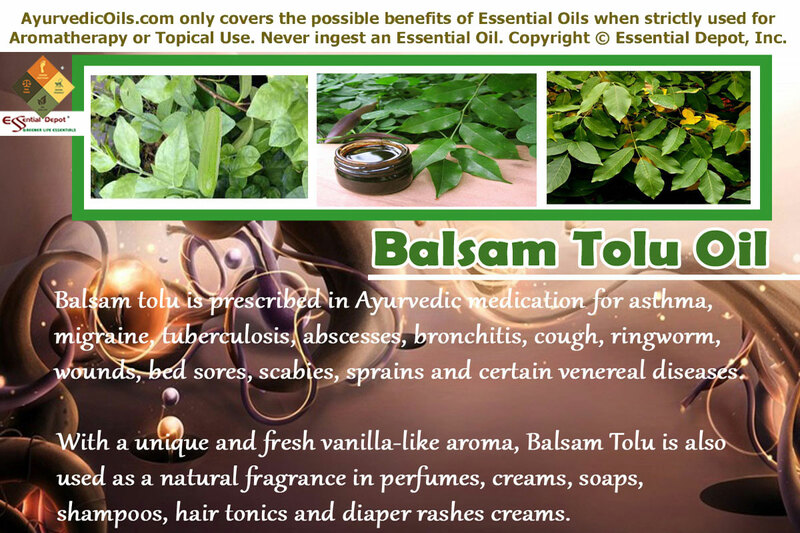 Balsam Tolu was first documented in the German Pharmacopeia in the 17th century. The book on “The Essence of Herbs” by Chrissy Brownlyn says “some native Indians used the bark in a powdered form as an underarm deodorant while others found it best for lung and cold ailments”. It further denotes that the credit of using this plant in pharmaceutical industry goes to the Europeans, especially the Germans who used Balsam of Tolu in treating skin problems like ringworm, scabies, diaper rashes, bedsores, wounds, head lice, dandruff and certain minor ulcerations, after identifying its anti-parasitic, antibacterial and antifungal properties. The mild and gentle vanilla and cinnamon like aroma of Balsam Tolu oil had supported its use as a flavoring agent in confectionaries, cough syrups, throat lozenges, chewing gums and soft drinks. The mesmerizing floral fragrance of this oil has been prescribed for use in relaxation techniques like meditation and yoga for soothing the mind and calming the senses. Balsam Peru oil and Balsam tolu oil are extracted from the same tree but by different extraction methods. Even today, Tolu Balsam is used in anti-dandruff shampoos, conditioners, soaps, female hygiene sprays, perfumes, hair tonics, detergents, skin care creams, perfumes, topical salves, ointments, deodorants, surgical dressings, suntan lotions, cosmetics, colognes and certain other medical aids and equipments. Among the 25 different chemical components, the major elements contributing to the therapeutic values of Balsam Tolu oil are cinnamic acid, cinnamein, benzyl benzoate, vanillin, nerolidol, cinnamyl cinnamate, benzoic acid, farnesol and other aldehydes. The most important therapeutic attributes of Balsam Tolu oil are antifungal, antiseptic, expectorant, anti-dandruff, anti-stress, analgesic and anti-parasitic. From men in the Stone Age to this Digital Era, celebrate Ayurveda as a boon to mankind for its holistic and regimented approach towards health and harmony. Ayurveda was gifted to humanity by Acharya Dhanvantari, the ancient God of medicine and is said to have its origin in India, the land of herbs and cultural heritage. This traditional remedy also holds the pride of being a part of Atharvaveda, one among the 4 sacred books of the Indian mythology. When compared to the modern medicine, where personal care and attention to individuals becomes a question mark, Ayurveda is a divine science that regards and respects human body as a temple where the soul lives in. With this thought of nobility, Ayurveda recommends mankind to keep their mind, body and soul clean, happy and content. The principles of Ayurveda rely on nature for everything as it strongly trusts that everything on earth is a vital part of nature. The visible proof behind this theory is that all things in nature are made up of five basic elements of nature, namely fire, water, earth, space and air. Human body is also made up of these five elements, where earth is present in the form of bones and muscles; water represents blood and fluids in the system; air is vital for breathing; space is the soul that dwells in and fire is the essential energy for body temperature, metabolic functions and certain other vital activities of the system. Ayurveda never goes by the fact that ‘one size fits all’, as it trusts that every human being is a distinctive part of nature composed with a unique individual constitution known as prakriti. It is a combination of three biological energies called as doshas. They are vata, pitta and kapha. Every individual has a predominance of any one of these doshas that acts as a deciding factor in determining the character, personality, attributes and behavioral patterns. Absolute balance between these doshas as per the law of nature indicates health and doshic imbalances due to climatic conditions, lifestyle changes, irregular food habits and moral vitiations leads to illness. Ayurvedic healing aims at treating the root cause of an illness instead of its symptoms alone. This aids in curing the disease initially and preventing it in the future as well. Ayurveda prescribes natural remedies that go well with the individual constitution of a person, even if a group of people are affected by the same medical condition. The prime Ayurvedic remedies are plant essential oils, simple physical exercises, herbs, yoga, prayers, Pranayama (Ayurvedic breathing exercises), meditation, Abhyanga or Ayurvedic massaging, Panchakarma or Ayurvedic detoxification techniques and Ayurvedic routine. Abhyanga or the art of massaging with Ayurvedic oils is an important Ayurvedic technique prescribed for healing numerous illnesses since the traditional times. Abhyanga is the traditional method through which the soft tissues of one’s body is maneuvered with the help of fingers, elbows, feet, forearms and other ancient massaging equipments. Augmenting the natural glow and suppleness of skin. Ayurvedic physicians generally prescribe the appropriate essential oil based on the prakriti and medical condition of a person. Balsam tolu oil is good to treat vata and kapha vitiations and pitta deficit. Massaging your system or affected parts with 5 drops of Balsam tolu oil, 2 drops of Patchouli oil, 2 drops of Frankincense oil, 2 drops of Lavender oil, 2 drops of Cardamom oil, 2 drops of Petitgrain oil along with 50 ml of Coconut oil can assist in relieving pain, soreness and inflammation associated with rheumatism, alleviating muscular tension, relaxing the nerves, enhancing the skin texture, improving slow digestion, treating constipation, supporting urination through which the toxic remains in the body are eliminated and promoting peaceful sleep and positive feelings. Skin is the largest organ of the human body and is the quickest transmitter of remedial properties to the bloodstream. Using Balsam Tolu oil in Ayurvedic massaging aids in passing away its healing values like antioxidant (helps in checking aging symptoms and discard the growth of free radicals in the body), antiseptic, cicatrisant and stimulating properties (supports in enhancing the skin health), diuretic, anti-rheumatic, analgesic values (aids in alleviating pain, eliminating toxic remains by promoting frequent urination, reducing inflammation, redness and stiff muscles) and anti-stress properties that help in relaxing the nerves, mind and induce good sleep. Balsam Tolu oil owns an exotic floral fragrance that makes it an excellent bathing oil that can help in leaving you fresh and energized all through the day. Using 2 drops of Balsam oil along with 1 drop of Cinnamon oil and 1 drop of Ylang Ylang oil in your bathing water or in warm or cold compress is a great way to recharge your nerves, enchant your muscles, lessen muscular tension, alleviate tension headache, back pain and calm your senses and instill a complete feeling of newness. A warm bath with this blend especially before going to bed is a great way to promote good sleep without any nightmares. Balsam Tolu has been used as a promising remedy for myriad skin problems since the times of the tribal populace. 2 to 3 drops of Balsam Tolu oil along with 1 drop of Turmeric oil mixed with your mild skin care cream or with 2 ml of Jojoba oil can be applied on wounds, eczema, minor skin ulcerations, acne, scabies, rashes, ringworm, bedsores, diaper rashes and skin infections caused due to fungi and parasites. The herbal blend of 2 drops of Balsam Tolu oil with 2 drops of Rosemary oil, 2 drops of Ylang Ylang oil and 2 drops of Basil oil along with 10 ml of sweet almond oil, applied on the scalp and hair, followed by a thorough rinse with your mild shampoo can assist in keeping away from dandruff, combat head lice, enrich the scalp and promote the growth of healthy hair naturally. Ayurvedic texts recommend the use of aromatics or aromatherapy as a major means of natural healing and prevention of illnesses. Smell or aroma has an important effect in balancing and stimulating various functions of the body. This action is performed by the odor-bearing molecules that influence the receptors in the nose while breathing. They reach the olfactory bulb of the limbic system in the form of nerve impulses. The aromatic molecules of Balsam tolu essential oil has expectorant, antifungal, anti-dandruff, antiseptic, anti-stress, anti-parasitic, analgesic, anti-rheumatic and stimulating properties. When inhaled by adding 2 drops of Balsam tolu oil in vaporizer, burner or diffuser, these molecules containing the therapeutic properties of this oil reach the limbic system. Following this, the hypothalamus and other vital parts of the limbic system convey the corresponding commands to different parts of the body as per the remedial values. Inhaling the soothing aroma of Balsam tolu oil can assist in relaxing the system, lessening pain, reducing fatigue, treating insomnia, and alleviating stress and depression. Ayurveda states that using Balsam tolu oil in diffuser or vaporizer specifically during meditation, yoga and Pranayama instills a sacred feeling as the mind is said to reach the most subtle and tranquil α (alpha) state during meditation. Inhaling the medicated steam is a proven natural remedy for alleviating cold, cough, sore throat, headache, sinusitis, blocked nose, watery eyes and migraine pain. Steam inhalation works effectively as the steam aids in bringing out the toxic remains in the body through sweat and one can feel the relief instantly after a medicated steam inhalation. Adding 2 drops of Balsam Tolu oil along with 1 drop of Peppermint oil and 1 drop of Eucalyptus oil in steam inhalation can aid in relieving headache, opening blocked sinus and nasal passages, soothing sore throat, discarding phlegm and mucus deposits and eliminating the microbes present in the system through sweat. When added to your vaporizing ointment, this blend can also be helpful in treating bronchitis, tuberculosis, chest congestion, nasal congestion, whooping cough and certain other respiratory infections. Certain test tube studies have revealed that Myroxylon plant has been effective in inhibiting H.pylori, the general ulcer-causing bacteria and Mycobacterium tuberculosis, which is responsible for lung diseases. This article is not meant to treat or diagnose any medical condition or substitute any professional medical advice. It is only for educational purposes and we are not medical practitioners. This heath related information is shared only with the view of spreading the ancient wisdom of Ayurveda, the oldest holistic healing system on earth. Never use essential oils for internal purposes. Always remember to dilute essential oils before using it for topical uses, as organic and 100 percent pure essential oils are highly concentrated substances and may lead to allergies, if used without diluting them. Discuss with your healthcare expert/Ayurvedic physician before taking the right call on the most suitable essential oils for your health condition and unique individual constitution. Keep away from Balsam Tolu oil, if you are a nursing or pregnant mother, as it is regarded as a sensitizing oil and may have chances of causing allergic reactions. “The balsam is stimulant and tonic, and is of use in chronic coughs, whites, palsy and chronic rheumatism. As an external application, it is employed with advantage in cleansing and stimulating foul and indolent ulcers”, quotes the book Ayurvedic Materia Medica for domestic use by Thomas John Graham. Also called as Peruvian balsam, the essential oil and the balsam as such are being used in the field of Complementary and Alternative medicine like Ayurveda and Homeopathy as well as in Modern medicinal practices. With its decongestant, antiseptic, antibacterial, antifungal and anti-rheumatic properties, Balsam Peru is prescribed in Ayurvedic medicine for treating bronchial asthma, whooping cough, bruises, bed sores, burns, eczema, respiratory infections, tuberculosis, headache, fever, diaper rashes, cold, scabies, ringworm and rheumatic conditions. Historical uses and importance of Balsam Peru essential oil and its other extracts: This tree is scientifically called as Balsamum tolutanum. Balsam of Peru is the resin extracted from the tall tree that grows in Peru, Bolivia, Columbia, Venezuela, Paraguay, Brazil, Argentina and France. Balsam Peru is also called by other names like Balsamum Peruvianum, Surinam balsam, Balsam fir oleoresin, Quina quina, Balsam Tolu, Toluifera pereirae, Indian Balsam, China oil, Myroxylon Balsamum, Balsams Peru, Myrosperum pereira balsam etc. Initially, Peru was the major and largest exporter of Balsam oil and it was for this reason, this Balsam was called as Balsam of Peru. 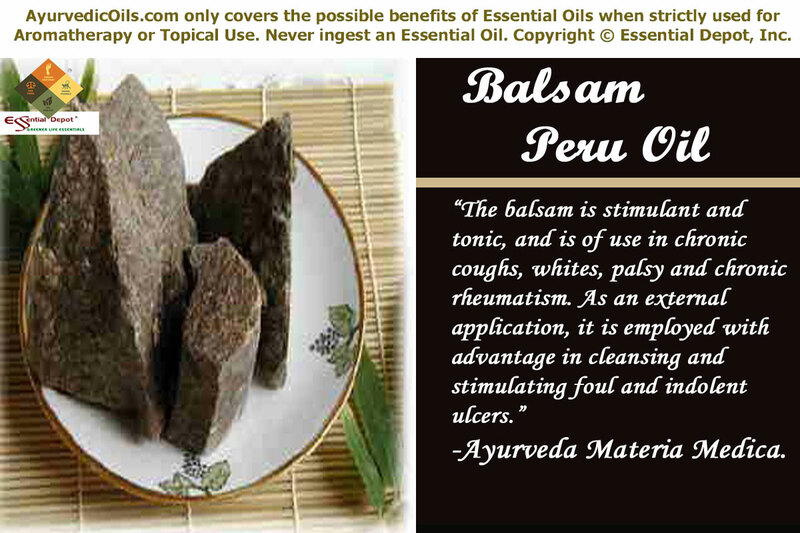 In recent times, Balsam of Peru is exported by various other major Balsam growing countries. This tree has a natural potential of producing resin, which is sticky in nature. Balsam of Peru is collected from Balsam trees that are roughly 20 years old by tapping method. Balsam of Peru has been a part of the traditional healing methodologies for centuries together. It was used as a natural remedy for treating digestive disorders, headache, cold, cough, respiratory infections and certain skin problems. The Native American populace used the powder extracted from this tree as a deodorant. Balsam of Peru and its essential oil has been a trusted remedy of the Europeans and other Asian folks for healing skin diseases like bedsores, ringworm, scabies, eczema, diaper rashes, wounds and itches. It is also used as an important ingredient in the manufacturing of female hygiene sprays, shampoos, insect repellents, topical salves, soaps, mouthwash, surgical dressings, skin care lotions and certain other fragrant ingredients. Studies have proved that the resin extracted from the Peruvian balsam tree consists of about 80% of cinnamic acid along with the presence of cinnamein. This is the reason for its vanilla and cinnamon like aroma. It’s essential oil is said to contain various volatile oils and the major components are benzyl cinnamate, benzyl benzoate, and nerolidol. 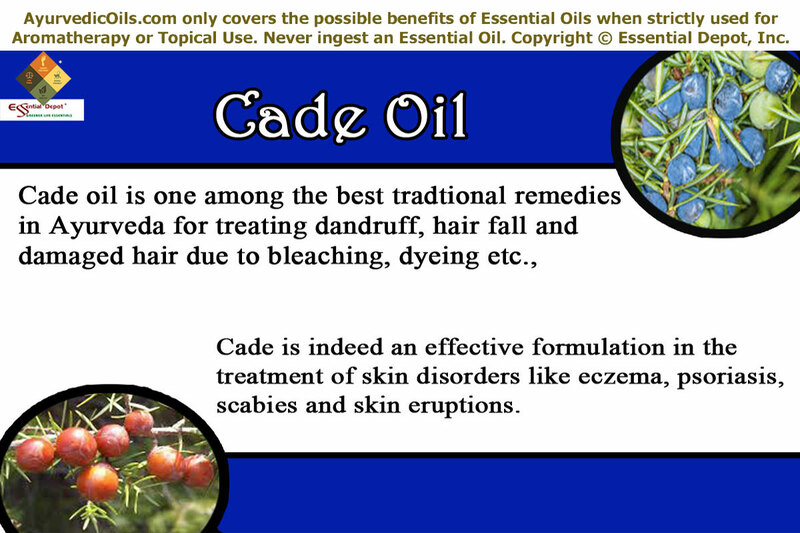 These components contribute to its remedial properties like antiseptic, antimicrobial, analgesic, anti-parasitic, expectorant, decongestant, antifungal, diuretic, antioxidant, deodorant, cicatrisant, anti-stress and anti-dandruff. The word ‘Ayurveda’ simply means ‘the knowledge of life’, where ‘Ayur’ stands for life and ‘Veda’ means knowledge. This oldest remedial system states that illness occurs when there is disharmony between an individual and nature. Ayurvedic healing considers every human being as a unique part of nature with a unique individual combination. According to this philosophy ‘no two individuals are given the same medicine, even for the same disease’. The first Ayurvedic consultation aims at analyzing the unique individual constitution of a person, which comprises of three biological energies known as doshas. They are vata (air and space), pitta (fire and water) and kapha (water and earth). These Ayurvedic doshas are nothing but a combination of the five vital elements of nature called as Panchamahabutas, namely fire, water, earth, air and space. Ayurveda states that every person has a prakriti (individual constitution), which is a combination of these doshas in a unique proportion with a predominance of any one of them. This prevalence determines the character, personality, uniqueness and behavioral attributes of a person. Based upon these fundamental qualities, the unique Ayurvedic treatment methodology and remedies are prescribed. Ayurvedic writings reveal that the absolute balance between these doshas indicates perfect health and harmony with nature, whereas doshic imbalances lead to sickness. The most notable Ayurvedic remedies include Ayurvedic essential oils, herbs, yoga, meditation, Pranayama or the art of balanced breathing, prayers, simple physical exercises, Ayurvedic routine, Abhyanga, and Panchakarma. With these remedies, Ayurveda focuses on treating the root cause of an illness instead of diagnosing its symptoms. With its stimulating and invigorating properties, Balsam Peru essential oil has been recommended in Ayurveda for augmenting pitta dosha and pacifying kapha and vata dosha. The essential oil of Balsam Peru has been used as an important ingredient in many hair care products including shampoos and conditioners for its antifungal, anti-parasitic and anti-dandruff properties. These remedial values help in clearing away dandruff, killing head lice and treating dry and itchy scalp conditions. Massaging your scalp with 3 drops of Balsam Peru oil, 2 drops of Lemon oil and 2 drops of Rosemary oil along with 5 ml of Coconut oil can be of great assistance in nourishing your scalp, clearing away the itchy flakes on the head, repairing your damaged hair and act as a hair tonic. You can also add 2 drops of Balsam Peru oil to your regular shampoo and enjoy the richness of your shining hair, free from dandruff and head lice. 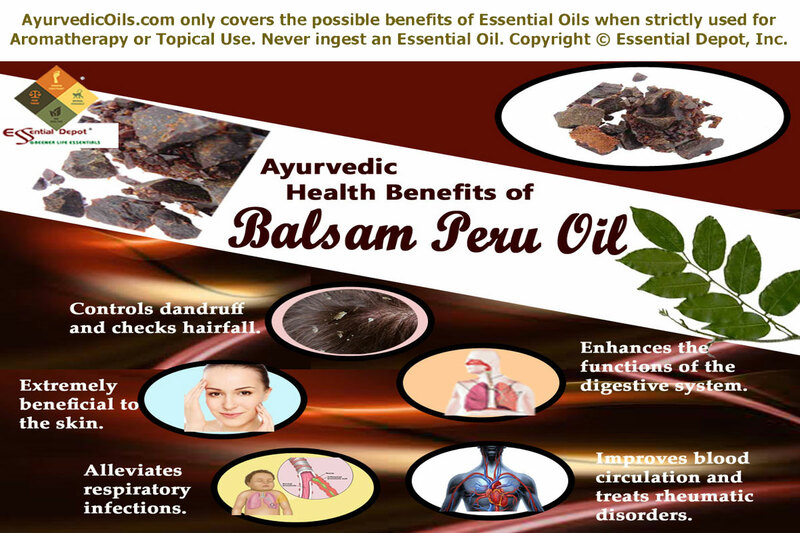 Balsam Peru oil is a time-honored skin care remedy that has been employed in the treatment of numerous skin problems including ringworm, bedsores, skin ulcers, wounds and diaper rashes. 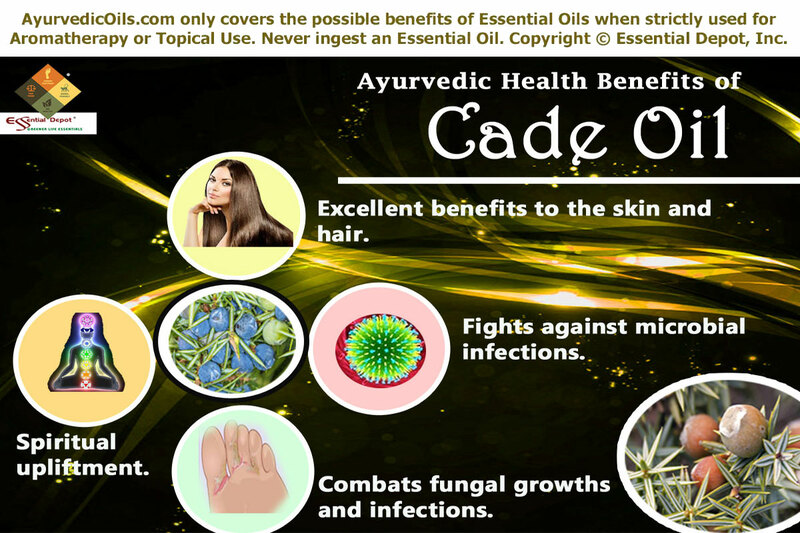 The antiseptic, antifungal, antioxidant and antimicrobial properties of this oil helps in quicker healing of wounds, combats the growth of microbes responsible for skin infections, and fights aging symptoms. Blend 2 drops of Balsam Peru oil with 2 drops of Ylang Ylang oil and 2 drops of Lavender oil with 3 ml of Olive oil. Gently apply this blend on skin problems like eczema, scabies, wounds, ringworm, acne, athlete’s foot, chapped skin, rashes and wrinkles. This natural skin tonic works like a wonder in treating fungal skin infections like ringworm and athlete’s foot with its anti-fungal properties; acne, rashes, wounds and eczema with its antimicrobial properties; wrinkles and dull lifeless skin with its antioxidant properties. Bedsores generally occur in sick people who are bed-ridden. This includes especially the aged population with sensitive skin. Mixing 1 drop of Balsam Peru oil with 2 ml of Jojoba oil can reduce pain and help in promoting quicker healing of wounds. This blend can also be used externally on diaper rashes for babies as well as the aged. According to Ayurveda, amassing of toxic substances or ama in the system is a major cause for many illnesses including respiratory problems. It is a known fact that excess of kapha dosha (blend of water and earth elements) is responsible for diseases based on the surplus fluid deposits in the system causing respiratory infections, obesity, rheumatism, edema and other inflammatory conditions. Balsam Peru oil has diuretic, expectorant and antimicrobial properties that aid in eliminating the excess fluid deposits in the system through urine and sweat, discarding phlegm and mucus secretions in the respiratory tract and arresting the growth of microbes that worsen respiratory problems. It has been used in the United States since 1800s as a respiratory aid and cough suppressant. Balsam of Peru was also used as an ingredient in cough syrups and lozenges. 2 drops of Balsam Peru oil along with 1 drop of Peppermint oil and 1 drop of Eucalyptus oil added to steam inhalation can help in relieving cold, sore throat, nasal congestion, headache, sinusitis, watery eyes, chronic cough, bronchitis, tuberculosis, asthma and inflammation of the pharynx. Gently rubbing your throat, chest, back and forehead with 2 drops of Balsam oil along with 1 drop of Tea tree oil mixed with your vaporizing ointment can help in relieving sore throat, bronchial congestion, blocked nasal passages, chest congestion, headache, sinusitis and drowsiness due to cold and other respiratory infections. Indigestion is the key cause for building up of toxic substances in the body. This is due to improper metabolic functions, including digestion, absorption and elimination. Pitta dosha is responsible for ‘Agni’ or digestive fire in the system. Vitiation of pitta energy often ends up in sluggishness, nausea, constipation, flatulence, loss of appetite and other digestive disorders. Balsam Peru oil has the ability to enhance pitta energy and can re-kindle the digestive fire. Inhaling the warm aroma of Balsam Peru oil by adding 2 drops of this oil to your vaporizer especially before your meals can help in enhancing your appetite, stimulating your bowel movements, treating constipation and promoting proper digestion. Massaging your abdomen with 2 drops of Balsam Peru oil and 2 drops of Nutmeg oil with 2 ml of sesame oil can support your digestive functions. Ayurvedic writings denote that rheumatism is an auto-immune disease that arises mostly due to the upsurge of ama or toxins in the system owing to the disparity of digestive fire. 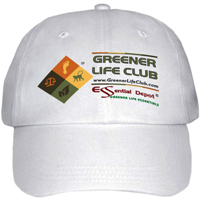 These harmful substances may even block the working of the essential organs in the body. Basically, ama stored in the body reaches the kapha dominated parts like fingers, joints, stomach, brain, chest, toes and few other parts. Thus rheumatism is identified with the symptoms of inflammation, redness of joints, soreness of muscles, lack of energy, swelling of joints, irregular blood circulation, insomnia and fatigue. With its diuretic, anti-rheumatic, antioxidant and analgesic properties, the essential oil of Balsam Peru has the potent to improve blood circulation, reduce pain, decrease swelling and inflammation by eliminating the toxic remains, excess water deposits, salt and uric acid through urine and soothe the joints and muscles. Massaging the affected parts with 3 drops of Balsam Peru oil with 2 drops of Cardamom oil, 2 drops of Yarrow oil, 2 drops of Bay oil blended with 20 ml of coconut oil can help in alleviating pain, inflammation, swelling, soreness, stiff muscles, water retention, insomnia and other symptoms associated with rheumatism. Ayurveda also recommends the practice of Pranayama or the art of balanced breathing in Ayurveda, through which the toxic remains in the system are discarded through exhalation. Along with this certain yogasanas can also help in treating rheumatic problems at ease and this has also been proved by various scientific studies. With its mild, warm and soothing aroma, Balsam Peru oil acts like a marvel in treating depression, mood fluctuations and negative feelings. To attain this solace, 2 drops of Balsam Peru oil and 2 drops of Benzoin Res oil can be added to your burner, candle diffuser or vaporizer during the practice of yoga, meditation and Pranayama. This can also aid in enhancing self-confidence and positive thoughts. Disclaimer: This information is meant only for the use of education and is not meant to diagnose or treat any health condition or replace any prescribed medications or professional medical advice. We are not healthcare practitioners and this info is shared only with the idea of highlighting the traditional wisdom of Ayurveda, the mother of all healing sciences. Never take essential oils internally and do remember to dilute essential oils before using it on your skin, as pure and organic essential oils are extremely concentrated substances and may lead to allergic reactions when used on the body directly. 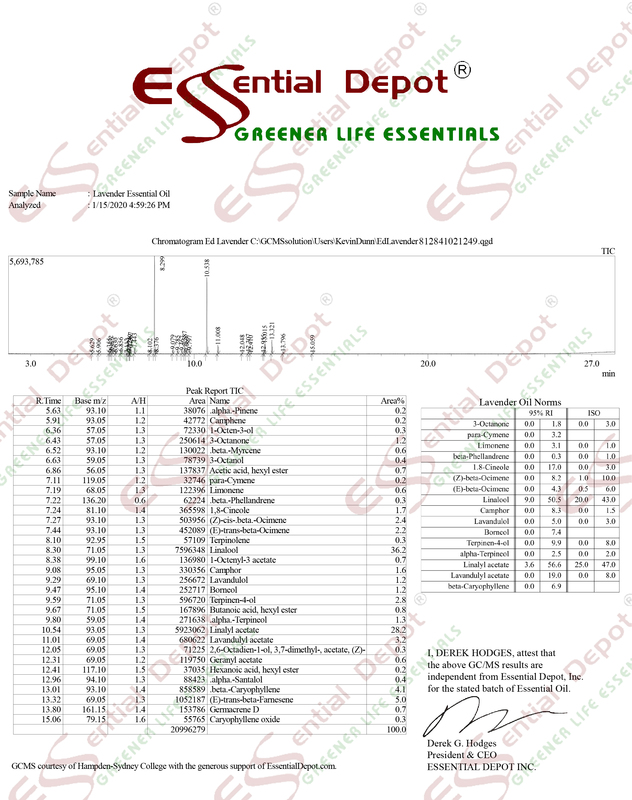 Ensure that you seek advice from your Ayurvedic professional/healthcare expert before selecting the appropriate essential oil for your health condition and unique individual constitution. Avoid using Balsam Peru oil if you are pregnant or breastfeeding, as it is regarded as a sensitizing oil that may cause allergic reactions.